You buy the official activation key for Borderlands 2: Game of the Year. After the first purchase, you receive a discount for all subsequent purchases of our products. • (addition) "Captain Scarlett and her pirate treasure"
• (addendum) "Mr. Torr arranges mesilovo"
• (supplement) "Sir Hammerlock opens the hunting season"
• (supplement) "Little Tina storms the monastery of the dragon"
• (addition) "The greatest seeker of the Repository!" 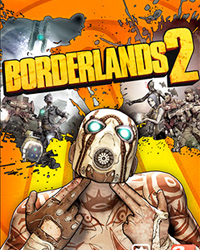 • (supplement) "The Dome of Bloodshed"
Borderlands 2: Game of the Year Edition - this is a new portion of adventure, which will please all fans of the series. The game will pleasantly please you with a huge number of add-ons, which for it came out, and are now available to you in a single whole. Among other things, the project will please you with new characters, locations, gold keys and costumes. The Game of the Year Edition was based on all the inside-game materials that were included in the collection edition. And with the purchase of this version, you have an excellent opportunity to evaluate them personally. By tradition, in your arsenal will be a huge arsenal of weapons, equipment and ammunition. You only need to choose a hero for yourself and equip it with the latest technology. Together with your character, you will have to go through incredible adventures, discover the secrets of Pandora, and regularly improve your hero, gaining the army of many thousands of enemies. The game will allow you to be in the thick of the events of the world Borderlands, which at every step is full of surprises. - One of the three buyers in a random order, who left a positive feedback after purchasing the game, can receive the activation key of the gift game. Which you learn after receiving the key. - To receive a gift, you must leave a positive feedback and add a request for a gift (Keys are circulated approximately within 48 hours from the time of writing the review). Продовец хороший, да и сама игра не плохая. Всем советую!